If you struggle in the morning, you may want to think about your evenings. What do I mean when I say that? Well, I have learned that in order to have a successful morning, I need to follow a specific evening routine. 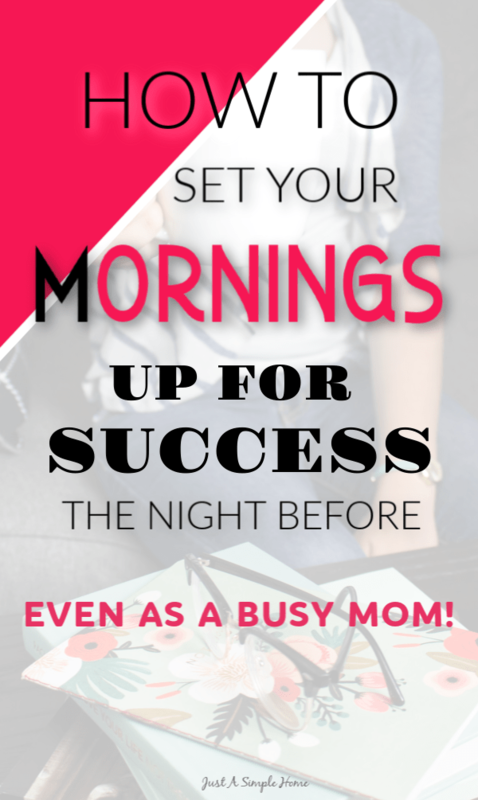 The success of my morning truly depends on what I do the night before. My routines have changed over the years, depending on the season of life I’m in, and my goals and intentions. But no matter what season I’m in, I adjust my morning and evening routines accordingly, and it makes all the difference. Here are seven things you can add to your evening routine for a better morning. If you’ve never heard of FlyLady, you probably think I’m a bit crazy already. Why would I have you start with shining your sink?! Think about it- if your sink is shining, what does that mean? That means there are no dishes in the sink, you started the dishwasher, you probably also have clean kitchen counters. Many, many years ago, I learned to shine my kitchen sink from FlyLady and I have kept up with that habit. I enjoy waking up to a clean sink! I am also particular with my counters; I want to be able to get to my coffee every morning! So, I do take a few minutes to clear and wipe down the counters each evening. I will tell you that when I am doing my evening routine, my children are doing theirs. Unless I am nursing the baby or doing something I absolutely can’t stop, I am cleaning when the kids are cleaning. This not only teaches them how to tidy up, but it also teaches them that our family works as a team. Everyone pitches in and many hands make light work. I grew up with a father who would bark orders from the comfort of a couch, and I vowed I would never do that. We work together and our nightly clean up only takes minutes. If you’ve been around here for awhile or we are friends on Instagram, you likely know that I am a huge planner person. I love planning, and making lists, and checking boxes. I love it because it helps me to be productive, but it also helps clear my head and dump everything out on paper. I use a Passion Planner right now, but also love the DaySpring planners. I also use Trello to basically run my entire life, digitally. I still use my paper planner, but Trello has taken the place of my household management and then some. It’s pretty amazing and it’s free! Each night, I take a few minutes to write out a list for the next day. I think of this as a brain dump. This helps me sleep easier because I don’t have to run through my to – do list when I get in bed; I know that everything is written down. I do have weekly and daily times when I plan, but this evening brain dump session helps me to be much more relaxed in the mornings. If I know we have appointments the next day, I will glance over those. But for the most part, my weekly schedule is already in my planner, because I do that on the weekends. So, I only need to take a few moments each day and make a running list for the next day. Then, I can reorder and prioritize that list when I wake up. I know, it sounds crazy. And sometimes it may actually seem impossible! I have seven children and two home businesses, so I understand. Sometimes I am just too tired to even think about taking time for myself. But, I have learned that making myself a priority, even for ten minutes a day, makes a huge difference in how I start my mornings. This is another tip that may seem silly to you. We are told to sleep in complete darkness, and many prefer that. However, I absolutely love waking up to the sun streaming in my window. It makes me happy to wake up. Many times I am already awake when the sun comes up, but I still enjoy it. Having a small sliver of natural light streaming in your room makes a huge difference in how your morning starts. Try it and see for yourself!! You knew this was coming! We can’t talk about having a successful morning without getting enough sleep. Make sure you are not staying up too late, even if you are a night owl. Try to go to bed at about the same time each night. A well rested body and mind makes for a far better day! I know it is impossible to get a solid 8 hours of sleep each night. I don’t remember the last time I did! But I make sure I am in bed at about the same time each night and I naturally wake at about the same time each morning. You don’t need to implement everything on this list right away. That would be overwhelming! Start by adding one or two tips to your evening now. Then, you can add in another tip to your routine after a few days. Work up to building a consistent evening routine over the course of a week or two and see what a difference it makes for your mornings! When building your evening routine, make sure you write it down (or add it in Trello). Each time you add a task, write it down. Soon, you’ll have your evening routine planned out and it will become just that – a routine! This doesn’t need to take long, either. My evening routine takes about 20 minutes each night, possible 30 minutes with interruptions. Do what works for you in the season you are in. If you want more help in going from overwhelmed to organized, you may want to sign up for my free 5 day course for moms where I share even more tips! You’ll also be invited to our online community for moms! Girl. If I don’t write down the routine, it ain’t happenin’! I remember about 0.1% of the things that I don’t write down! These are such great tips for an evening routine, and it’s similar to mine. Winding down properly helps to wake up properly! What great tips to help end the day strong and start the next one with less stress! I especially like the tip to prepare for the next day. It’s so much easier for me to do those small things at night than in the morning when everyone is clamoring for my attention! Love these ideas, Terryn! I have been trying really hard to make “shine your sink” a reality lately. It doesn’t always happen, but I am hopeful that it will become a habit for me! Developing an evening routine is something I’ve been trying to do for a while now. I have a great morning routine — based on the Miracle Morning and my day starts at 4 AM — but I don’t really have a “wind down” procedure before bed because of how much stuff I do after my day job on my side business. Food for thought! I am a huge fan of making sure my kitchen counters are clean before I go to bed. I need to work on making sure the inside of my sink is clean too though! I often leave that….eek. These are such awesome tips! I’m definitely going to start incorporating them into my evening. I love the idea of sleeping with the curtains open. Great tips! I am definitely a morning person but I have a hard time getting everything ready in time to go to work. These tips could definitely help me become a more effective morning person by doing some things in the evening! I love the idea of sleeping with the curtains open. I’d never considered that before but I think it would make my mornings so SO much smoother.